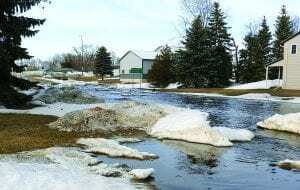 The water broke loose to gush down Mannston Street in Gettysburg last week, signaling one of the first signs of spring. The heavy snow from the storm a couple weeks before that gave the runoff a few more chunks of snow and ice. Although it has subsided considerably, the runoff is expected to continue as the snow melts, but reports of temps into the 60s for the weekend should help move it along. If you didn’t get a chance to take a tour of town while the water was running, you can catch a video on our website.